What is the Perform with Times Tables? The pre-publication trials showed that the book was successful where many other methods had failed. Those individuals that have worked through the book have increased their skills with multiplication and division, with a major positive impact on other areas of their maths. Its success has meant that it is fast becoming one of our most popular books. Why does the book work so well? Firstly, it links all multiplication facts with the corresponding division facts. So whenever 7 x 6 = 42 or 6 x 7 = 42 is mentioned, 42 ÷ 7 = 6 and 42 ÷ 6 = 7 will also be practiced. We believe that it's vital to link multiplication to division, and that it aids memory and understanding to do so. Secondly, and most importantly, the order which the facts are introduced differs from the usual sequence. Students are normally taught to learn their times-tables facts starting with the x2 table, moving on to x10 and x5. This is often followed by x3, x4, x6 and x9 before finally x8 and x7 are learnt. However, many students struggle to keep pace with the new facts which are introduced, and don't have the necessary repetition with the reinforcement they need. This traditional method often presents too many unknown facts in one go. Our book takes an unusual twist to remedy this issue. 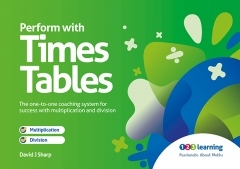 Our Times Tables book is suitable for those aged about 7 and upwards. The book is designed to appeal to all age ranges and has been used for adult basic skills. The clear language and repetition benefits students with dyslexia and those with English as an Additional language. Students with dyscalculia benefit from the highly structured approach with clear explanations. .
Can be used as a stand alone or in conjunction / following on from Power of 2. Full instructions and example pages are included in each book, but essentially Times Table requires that each question is answered correctly on three consecutive occasions on different days. When a question is answered correctly a tick should be placed on the line, a question answered incorrectly is marked with a dot. On each page of the book there is space for working out solutions, but students should be encouraged to carry out the calculations in this book without using pen and paper. It is not intended that certain pages should be used in isolation. Times Table has been found to work best when it is used 4 or 5 times a week, with each session lasting for about 10 to 15 minutes. We're very happy for you to contact us if you have any queries - we really like to get your feedback!